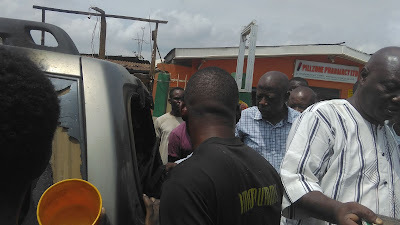 It was indeed a panic site as a Nissan Patfinder Jeep caught fire earlier today in front of a gas shop at Ogunremimo street, Mafoluko Oshodi Lagos. The owner of the vehicle who is an employee at the Murtal Mohammed International airport was on his way to work this morning with his friend when passersby brought to his notice the smoke coming from the car. Quickly, he and his friend were able to leave the vehicle before it burst into flames in front of a gas shop. 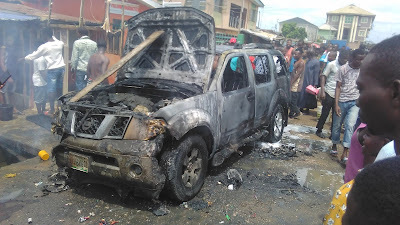 The fire outbreak was identified to be caused by electrical issues in the car. According to him, he claimed he took the vehicle for rewiring as at Saturday and had the car returned to him on Sunday but to his surprise, the car still had some issues. Residents of the area vacated their homes from fear of an explosion in case a gas leaks or the fire spreads. There were no casualties as people took to action and moved the gases far from the fire site. The residents were able to put out the fire which lasted for about thirty minutes before the fire service arrived. 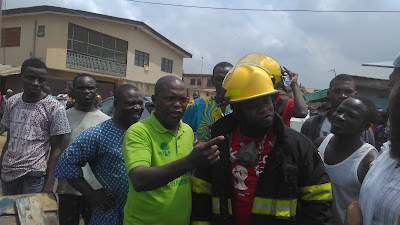 This resulted to an angry mob attempting to attack the fire service men due to their unprofessionalism. It took the head of the dispatch unit to calm the angry mob.